At Quadio, we believe that technological innovation and its benefits to humanity go hand-in-hand. We place equal value on developing advanced innovations and on creating social programmes that bring the benefit of our products to everyone. As a country of 1.2 billion people with only 2000 qualified audiologists, India lacks severely in hearing health management facilities and consequently has low awareness about maintaining hearing health and options for managing hearing loss. Noise pollution is a major problem in India with children being particularly vulnerable as damage to hearing can cause problems in development of language and social skills. 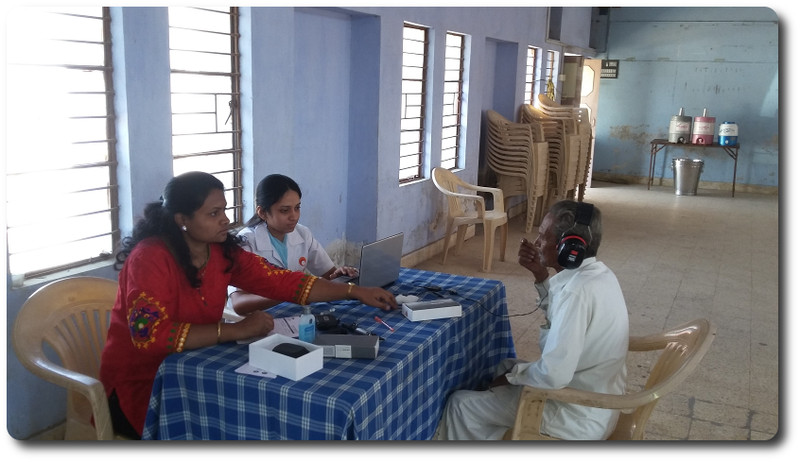 Quadio aims to bridge the gap between the need for professional hearing health care and the lack of availability of such services by organizing mobile clinics that are equipped with our innovative Net Dispensing facility to bring free world-class hearing evaluation and counselling to those who need it. Mobile clinics' purpose is create awareness about hearing impairment, guide patients about possible options to manage their hearing impairment and provide audiology solutions. We also aim to bring closer those who need help with those who can help. Along with free hearing and counselling, we dispense quality semi-digital and digital hearing aids at large discounts to those in need of hearing rehabilitation. We have organized clinics in numerous cities in Gujarat and Maharashtra and continue to organize these clinics with an aim to expand our reach across India. Look for announcements about upcoming clinics on our website, Facebook and Twitter pages. Visit us when we are in your city if you need your hearing evaluated and we will be pleased to help you. If you wish to partner with Quadio for spreading hearing health awareness, please click below to fill the form to contact us. Thank you for expressing an interest in partnering with Quadio for the hearing health awareness initiative! Khambat is a small town in Anand district in Gujarat with a population of 80,439 and is perhaps the only place in India where the ancient craft of agate bead-making, dating from the Indus Valley Civilization, is a living tradition. Khambat has very limited access to hearing health services and a large number of people who require such services but cannot reach them. On March 4, we launched our free mobile hearing clinic at Anand and set up our camp at Khambat. Kamalaben was directed to the mobile hearing clinic (see Quadio's Mobile Clinics at Kheda and Anand) by a local social worker. We evaluated her hearing and diagnosed that she suffered from severe loss in both her ears. Kamalaben has limited resources, earning her living doing odd jobs, and cannot afford to purchase hearing aids. Our employee, Anand Sahasrabudhe, discussed our mobile clinic campaign with a patient in Pune, Mrs. Borawar. Mrs. Borawar, who was already in the process of buying her new hearing aid as an upgrade from her current device, kindly donated her old hearing device, which was in excellent working condition, to help out Kamalaben. During our follow-up visit to Khambhat for fitting devices for patients, we visited Kamalaben and programmed the hearing aid for her specific hearing loss and fitted it for her left ear. After a long period of living with listening deprivation, Kamalaben could finally hear sounds with clarity. As she lived alone, her neighbours turned out to help us help her with fitting and device management. Our team was overjoyed to help Kamalaben with a hearing solution amidst the spirit of community camaraderie. Quadio is proud of our employees for engineering a hearing solution for Kamalaben and thanks Mrs. Borawar for her help. We are exultant about continuing our work of spreading hearing health awareness and help across India. 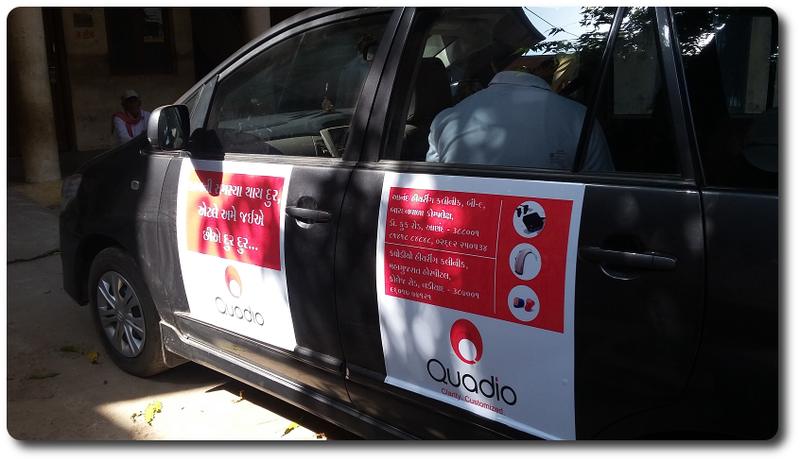 Quadio launched a pilot mobile clinic project in Gujarat on 4th March, 2016 from Khambhat, District Anand, Gujarat. Anand and Kheda districts put together have a population of 44 Lakh. With only two audiologists in Anand, the vast majority of the population is deprived of access to qualified medical facilities for hearing health. Our mobile clinic was, therefore, a much required service for both providing hearing services and for raising awareness of treatment. A total of 93 patients visited our mobile clinics in five days. Hearing loss can sometimes occur from treatable causes such as buildup of excessive earwax or an ear infection. We were able to successfully counsel 14 patients whose hearing trouble arose from compacted wax in their ears. For the rest of the patients who seemed to suffer from hearing loss, we conducted hearing loss evaluation (audiometry). Ninety percent of patients who were tested suffered from some degree of hearing impairment. Of these, approximately 80% were getting their ears tested for the first time either due to a lack of audiology services in the vicinity or due to the prohibitive cost of testing. During testing, we came across Tirth Dineshkumar Rana, an ebullient nine-year-old, from Khambhat. Young Tirth suffers from congenital moderate-to-severe hearing loss resulting in trouble with development of language skills. Due to his hearing disability, he faces many academic issues, as he has difficulty following lessons. We test-fitted Tirth with a Baseo Q15 SP hearing aid and saw a remarkable improvement in his hearing ability. We are proud to have been able to help 28 other patients by providing them with an experience of proper hearing evaluation and counselling. Our mobile clinics are an ongoing initiative where we hope to cover every corner of India to provide hearing health awareness and hearing management to everyone who does not have access to such facilities. Quadio held a hearing check up camp in Shree Jalaram Janseva Trust - Dharmaj on 24th December 2016. A total of 27 patients registered for the camp out of which 8 patients were detected with hearing loss. These 8 patients were provided with proper hearing aids by the team.